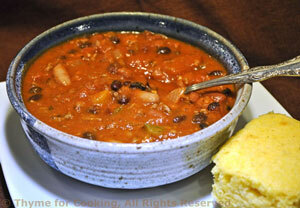 Chili, with tomatoes, beans and beef, Thyme for Cooking easy Supper Soup. This is my recipe. I know it is not authentic 'Texas Chili'. If any of you 'Chili' aficionados want to argue about what's wrong with it go ahead. I use tomato juice to 'thin' it. This is purely to taste. I use 1 - 2 cups; mon mari would use none, my sister would use 5 - 6. You can drink or freeze any unused juice in 1 cup portions. Drain green chilies and chop if whole. Heat olive oil in 5qt (4 litre) Dutch oven or stock pot . Add 1 tbs chili powder and sauté for 1 minute. Add onion and pepper, sauté for 5 minutes. Open pinto beans and remove pork if any. When beef is brown add tomatoes, juices, and beans. Stir well. Add green chiles, herbs, beef paste, 1 tbs chili powder and Worcestershire. Heat to boiling. Add 1 or more cups of tomato juice. Cover, reduce heat and let simmer at least 20 minutes. Taste. Add more chili powder, jalapeños, hot sauce, if you choose. Simmer 10 minutes more - or longer. Taste again... Adjust again if you like. Note: You can keep adding chili powder, chiles, jalapeños, hot sauce, whatever, until you get the taste you want. Just remember to simmer for 10 minutes, to blend the flavors, after each adjustment.